2018 State of World Liberty Index — J. Patrick Rhamey Jr. 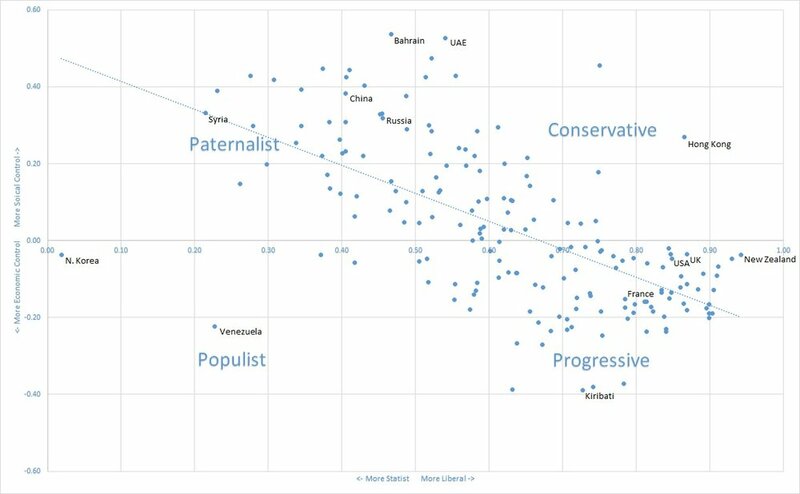 Finally, added this year is a ranking of the Conservative-Progressive spectrum, where conservative would be very high economic liberty but low social liberty, and progressive would be very high social liberty but low economic liberty. This added dimension allows for grouping states by both freedoms and ideology, such as Moderate Free (New Zealand) and Moderate Tyranny (North Korea), Progressive Free (Norway) and Progressive Tyranny (Venezuela), and Conservative Free (Hong Kong) and Conservative Tyranny (Syria). Also please note, rankings used to create the below are typically delayed by one to two years. So, they do not reflect any recent events that may have occurred within the past 6-12 months. 2018 Liberty by Quintile. Colors represent countries grouped by quintiles in order of blue (top 20%), green (20-40%), yellow (40-60%), orange (60-80%), and red (80-100%). 2018 Five Year change in Liberty. Blue is an increase in rank by >20 and green >10 since 2014. Orange is a fall in rank of >10 and red >20 since 2014. 2018 Conservative-Progressive Ranking. Grouped by quintile, red is very conservative, pink is conservative, yellow is neutral, light blue is progressive, and blue is very progressive. Below image graphs the amount of liberty enjoyed by the average citizen in a state (x-axis) by the balance on whether the state more heavily regulates economic or social behaviors (y-axis).